What if I told you that the fountain of youth has been discovered and is available for you to dive right into, would you go for it ? Meet Annette Larkins, a 70 year old woman from Florida who looks more like 35 says she have found the fountain of youth. Anette says that the fountain of youth she discovered is simply her raw plant-based foods lifestyle. She does not eat any animal products, cooked or processed foods. “My diet consists of fruits, nuts, vegetables and seeds. I do a lot of sprouting of seeds and as you can see from my garden and of course these are the raw foods that I eat.” She is also very much into juicing fruits and veggies or various sorts. Anette is of course not alone in her discovery. Countless number of others individuals have reported the same phenomena and discovery after switching to a raw plant based diet. Lets take a look at a few more video testimonials. Meet Jim Morris, a 72 year old bodybuilder who also thrives on a raw plant-based food lifestyle. Meet Mimi Kirk , yet another 71 year old woman who thrives on a raw plant-based food lifestyle. She has been named ‘the sexiest vegetarian in the world’. Its called the China-Oxford-Cornell Study, lead by Dr. T. Colin Campbell, Jacob Gould Schurman Professor Emeritus of Nutritional Biochemistry at Cornell University and Thomas M. Campbell II. Talk about a nightmare for insurance companies in terms of ‘longevity risk’! So now that you know about the fountain of youth, are you willing to go for a dive now that you also know it requires changes in your own lifestyle & your choice of foods? Are you willing to achieve the same results as Anette Larkins, Jim Morris and Mimi Kirk ? Most of us want change, but rarely as often are we willing to change our habits to make way for the changes that we want. Its not about stoping to eat something that you enjoy very much, its about starting to eat new enjoyable goodies. Its about increasing the number of enjoyments. Know that you don’t need to suddenly & completely give up everything that you are enjoying to eat. What you do is to slowly sneak in the goodies and the healthy habits in your daily food routines and increase the dose gently; and by the time you start seeing amazing results you won’t even notice that you have shifted your enjoyments. Who doesn’t like the taste of sweetness and enjoy fresh juices anyway? Its super easy and all and all, it will take about 5 to max. 20 minutes to prepare a healthy, vibrant and rejuvenating juice filled with life force energy. From start to finish, including the dishes. Making smoothies with the blender goes even quicker. I’d recommend; make a big smoothie in the morning for breakfeast every day. And make a nice juice in the evening. Thats a good start and it will only take about 20 – 30 minutes minutes of your day. In parallel to this start increasing the raw vegetable content of your meals and snack on lots of fruits during your day (instead of candy, processed sugars & junk food alternatives). 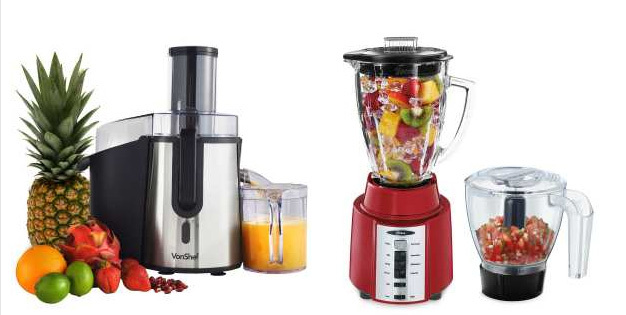 You can buy the tools to make smoothies and juice for less than 120 USD altogether. These are all the machine tools you need to to prepare 80 % of all raw food recepies. The only thing missing (to make the remaining 20 %) is a food dehydrator, but that is for the next stage. For now, just go with these. A good start to get some inspiration on what fruits & veggies to buy and use is to look online (google & youtube) for fresh fruit & vegetable juice recipes and for raw & plant based smoothie recipes. There are hundreds of awesome people out there sharing their delicious recepies all for free. You can be creative and intuitive and use whatever fruits, veggies, seeds, nuts and other plant based ingredients that you like (such a coconut oil, turmeric, cacao powder and so on) and mix it with the right amount of water to get the perfect consistency and voila, you’ll find your own style and taste. Go bananas & nuts. Don’t worry about failing. Trial and error is the best way to evolve and learn. Having fun while doing it is the most important part! Have in mind though that for this to become a fountain of youth for you, its necessary that you use only PLANT BASED, organic, raw and fresh ingredients that still carry the vibrant life force energy (prana, chi, ether) within. If you do these three steps every day for at least a month, you will feel good, energized, healthy and have less cravings for unhealthy processed & cooked fast food carbs and processed sugars. Which will be the basis for your next steps towards much healthier & more enjoyable food habits. You will for sure know where to go from there on, as long is there is a willingness to take things to the next level, an opportunity and some inspiration (maybe in the form of an article) will pop up. Just listen to your body and that inner voice that thirsts for a more vibrant & energetic life. The ONE FINAL STEP IS TO RESEARCH ALL SUPERFOODS YOU CAN FIND LOCAL TO YOU. Its important to locate all superfoods that you can use in your daily diet. Alot of foods we use today have hidden super qualities and if we do the research we can find what is going to help our specific conditions and keep us alive the longest. Campbell, T. Colin. “The China Study”, The Huffington Post, June 28, 2008. Nestle, Marion. Food Politics: How the Food Industry Influences Nutrition and Health. University of California Press, 2007. Nutrition Health Review. “The China study—what it means: an interview with T. Colin Campbell, Ph.D.”, September 22, 2004.